Happy Halloween! These are the nails I'm sporting for the occassion- a fun mix of sugar skulls and gingham. That yellow colour is actually a lot more orange in real life. It's a neon so evidently it went crazy on camera. 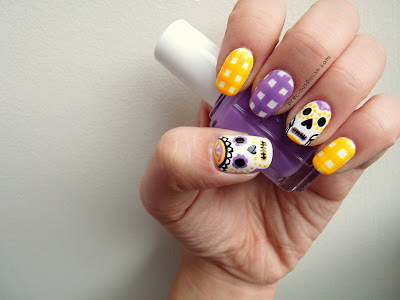 Recently I've seen a lot of sugar skull nails and I really love the style. I figured that now was a great time to try them out and they were surprisingly simple to do :) I got the gingham idea from these cute Halloween nails by Pink Poodle. I used OPI Alpine Snow on all of my nails to start. The purple is Essie Play Date and the orange is American Apparel Neon Orange. I used a black striping polish, striping brushes and dotting tools for the sugar skulls. The gingham was free-handed with a striping brush. I'm very pleased with how these turned out and I hope you like them too! What are your plans for tonight? Again, happy Halloween and stay safe! Greetings! How's the weekend treating you so far? I should be studying for calculus, but I'm not, go figure. I have one more midterm on Monday and then I'm done with tests until November (cue rejoicing). I was going to bore you with yet another tribal manicure but I'll save that for another time ;) Instead I tried something pretty different. I went for a classic black and gold combination with filigree accent nails. The rest of the nails are a gold gradient with black glitter on top. I painted all nails with China Glaze Liquid Leather. I used a striping brush and Sally Hansen Gilty Pleasure for the filigree and I sponged it on for the gradient. I topped the gradient nails off with LA Girls Uninhibited. Hi! Sorry for the small absence last week- it was a busy one! I ended up wearing plain full-colour manicures all week. I finally had the chance to play around on Friday and this unintentionally American-looking manicure is the result. It consists of a dreamy pink-purple-blue gradient, typical tribal prints, and some cute stars thrown in for a little variety. 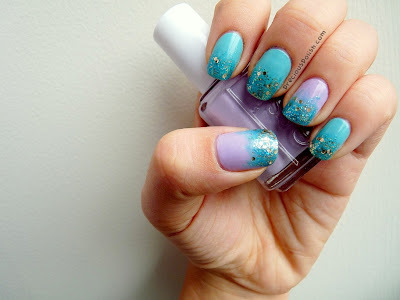 The colours I used are Essie Van D'Go, Essie Nice is Nice, and China Glaze Kinetic Candy. 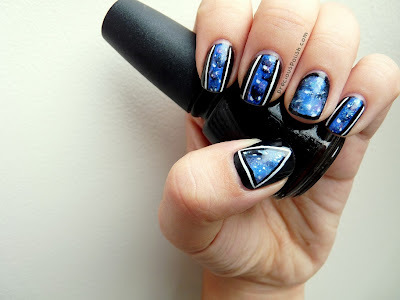 The tribal print and stars were done with a white striping polish. I painted all of my nails with China Glaze Liquid Leather. I used a makeup sponge for the galaxies, first sponging on a layer of Nails Inc Baker Street. I then sponged on a bit of OPI Alpine Snow, then Nails Inc Baker Street again for depth. I added small bits of China Glaze Sweet Hook, American Apparel Office, and American Apparel The Valley. Finally I added some white dots of varying sizes for stars and a bit of Sinful Colors Hottie for sparkle. I used a black striping polish to outline all of the shapes and filled them in accordingly. I then used a white striping polish for some additional borders. I have a simple manicure for you today. Looking at my unruly collection of polishes, I kept being drawn back to this minty shade. Once I had it on I couldn't bare to cover it up completely so I did a very subtle white tribal gradient. For the accent nails I started with OPI Alpine Snow. I sponged on American Apparel Office for the gradient and applied it to the rest of my nails. For the tribal print I used a white striping polish. Thanks for looking, much love!